The academic indicator(s) is made up of the performance of students on the SBAC ELA (English Language Arts) and Math assessments. This measure is different from the previous way the state measured performance on state standardized assessments. Previously, performance was calculated as the percentage of students who met or exceeded standards. Now, performance is calculated as the average of scores, calibrated to the score needed to meet standards for each grade level. So, unlike before when only those students with scores above the score needed to meet standards were 'counted', now all students' performance contributes to the measure, not just those who met or exceeded standards. This means that schools will get credit for moving student scores anywhere along the scale, not just when they pass the score needed to meet standards. New to the Fall 2018 release is the inclusion of grade 11 results and the adoption of a new reference grid for grade 11 results for determining performance levels. Also new to the fall release is the application of the 95% participation adjustment (see below). New application of "Pair and Share" to address the need for an academic indicator result for schools serving students in grades K-2. Here, schools that only serve grade K and 1 students, the state will assign the grade 3 DFS results for the district to that school. For schools that serve grade 2 but not grade 3 students will be assigned the grade 3 DFS result of the school to which the grade 2 students matriculate. Note that these K-2 schools were asked to indicate 'matriculation schools' for their 2nd graders to the CDE. The result for up to three schools is combined in a weighted average based on the % matriculating to each. Status is the average scale score distance from meeting standards which is also called DFS. This value is calculated by taking each student's scale score on ELA, and separately, Math, and subtracting it from the scale score needed to meet standards for that grade level. These student DFS results are then averaged across students in a school to get the overall DFS result. This calibration to the scale score needed to meet standards is necessary due to the fact that the range of scale scores possible varies by grade level (see below). Note that in prior release versions, the abbreviation DF3 was used. This was updated by the CDE for the Fall 2018 release. New to the Fall 2018 release will be an adjustment to the DFS score when schools/LEAs test fewer than 95% of their students (per ESSA). If a school/LEA fails to meet this target participation rate, their DFS score will be reduced by a quarter point for each percentage point they are shy of the target. For example, if a school had a DFS of 100 but only tested 85% of students, their DFS would be adjusted down by (0.25*(0.95-0.85)) = 2.5 points for a DFS result of 100 - 2.5 = 97.5. Change is the difference in the DFS result between the most recent year of data and the prior year. For Fall 2018, status data uses results from 2017-18 and change is calculated as the difference from the 2016-17 result. Note that the Academic indicator includes results for students in grades 3-8 and 11. Although the results for 11th graders are included in the College/Career measure, they are also reported separately under the academic indicator to accommodate Federal Every Student Succeeds Act (ESSA) requirements. Also note that for this measure, English Learner (EL) students include all English Learners plus any students who were reclassified within 4 years of the testing date. This means that schools get credit for the performance of their recently reclassified English Learners. Newcomers who have been in the US for less than a year are not required to take SBAC and are not included in the Academic Indicator calculations. 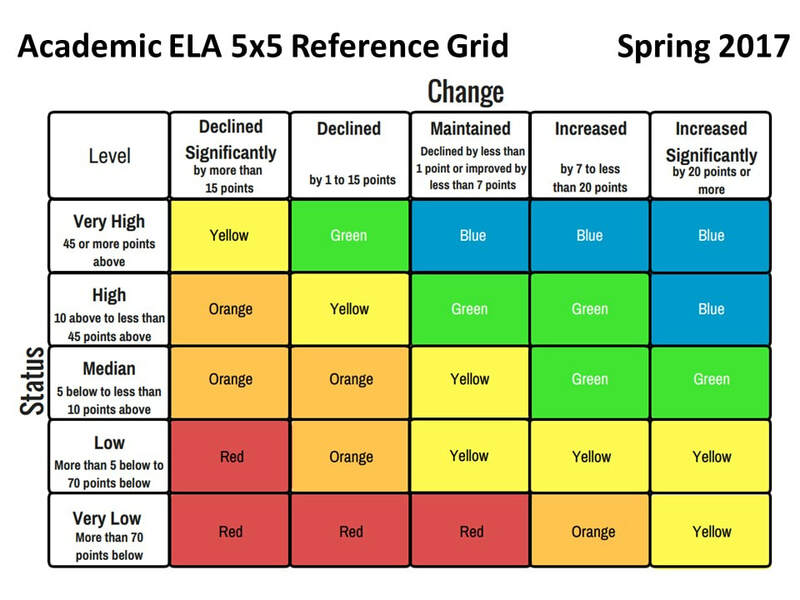 The image above shows how the score needed to meet standards (shown by the green bar) increases across grade levels. 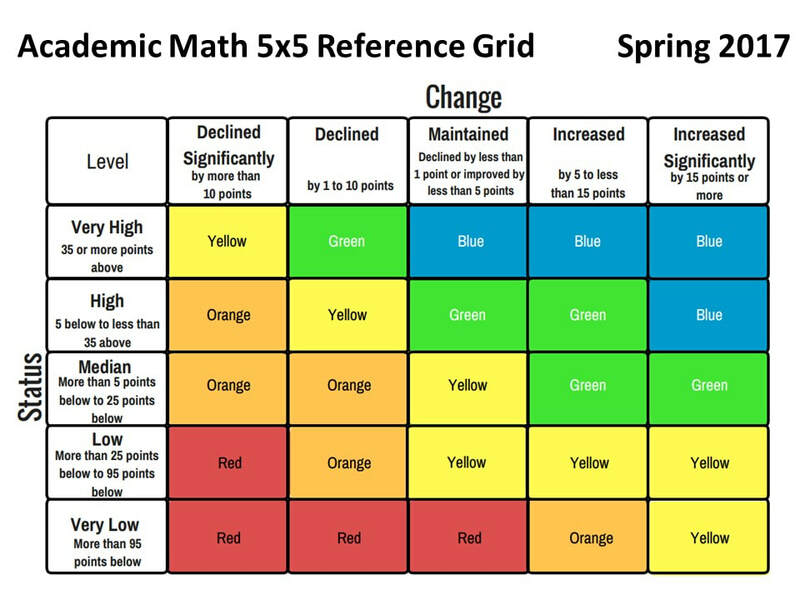 It also shows how the range of possible scores changes with grade level. 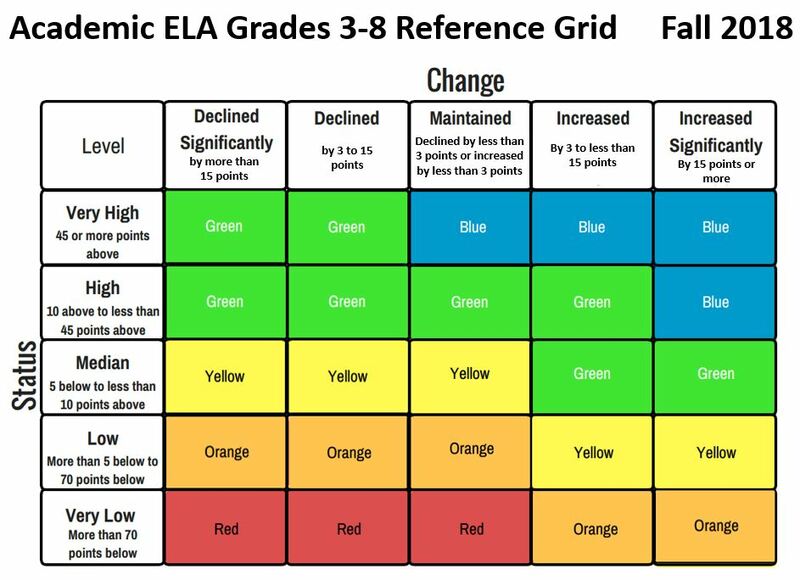 In November 2017, the State Board of Education approved a new set of cut points or reference grids for grades 3-8 ELA and Math due to large shifts in the distribution of results on the Academic Indicator across Local Educational Agencies between the Spring 2017 and Fall 2017 release dates for the California School Dashboard. 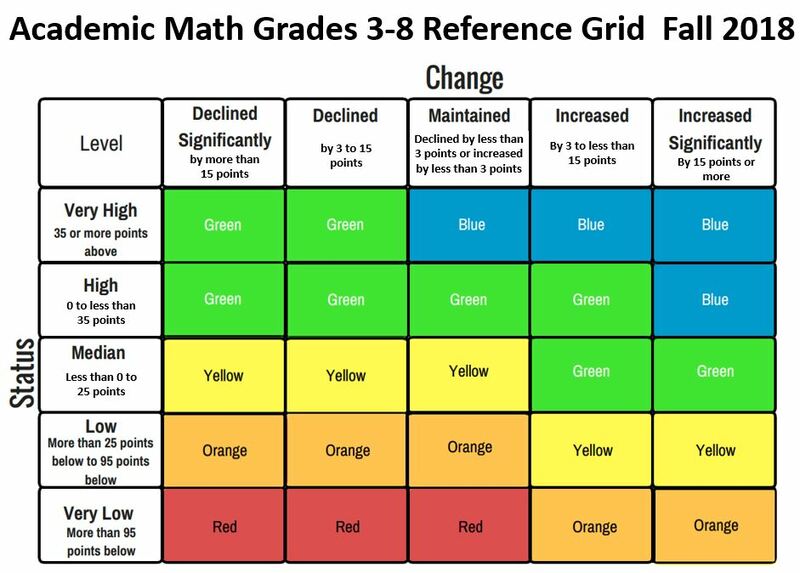 The Fall 2017 reference grids are based on two years of results, and should result in fewer large swings in the assignment of color performance levels to schools/districts across future releases. 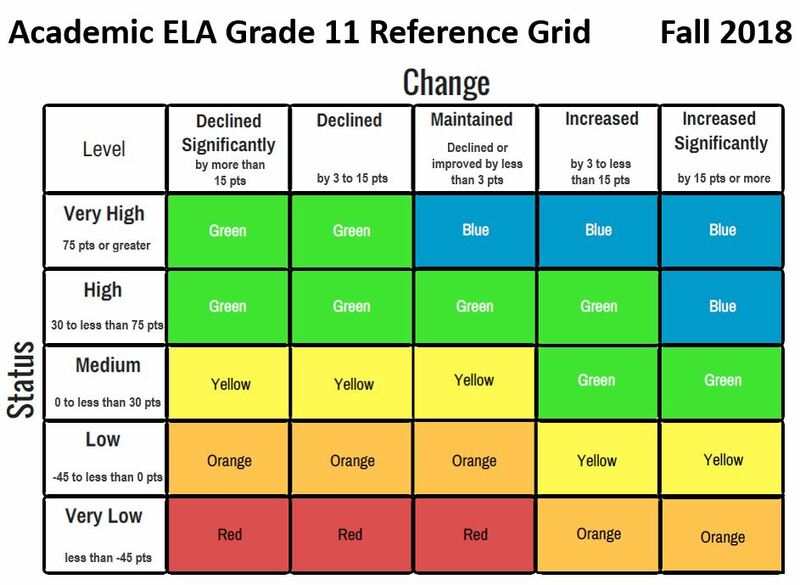 New reference grids were adopted in November 2018 for grade 11 ELA and Math results in the Fall 2018 dashboard. These new reference grids apply only to grade 11. 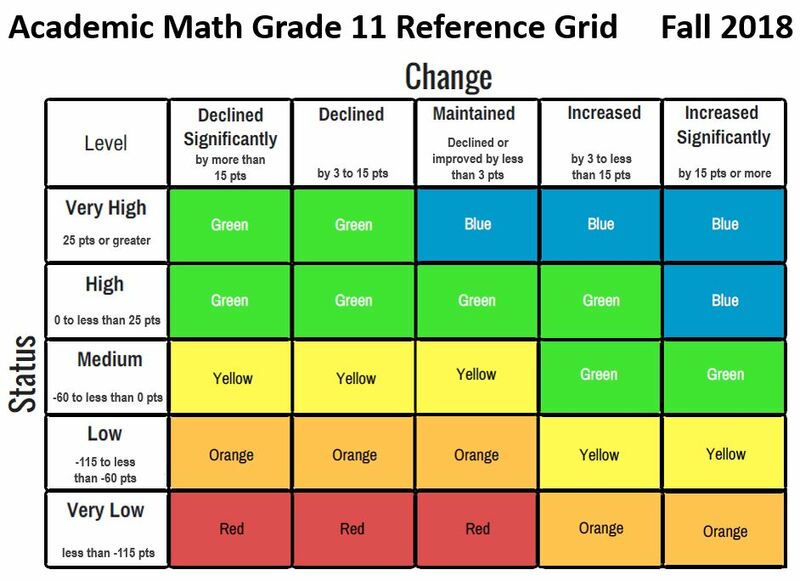 The reference grids used in the Fall 2017 release for grades 3-8 remain in effect for those grades in the Fall 2018 release. Click HERE to view all reference grids for all of the measures that go into the Fall 2018 California School Dashboard and Oakland Public School Report Cards. Below, the Academic Indicator reference grids for the current and prior releases are shown.